What option do you prefer to control hair highlights size? Let's share our tests and for fun renders with the new hair shader here! My only feedback so far is that lowering opacity makes rendering extremely slow. looks like a fun material to play with, is highlight shift the same as anisotropy reflections? Downloaded the hair farm demo and one of the example scenes. I did this back on the Jun 21st build and i'm not sure if anything has changed since then but i did have some strange issues with the GI precomp hanging when rendering the Hair material (both render and interactive render). Anyways the setting are slightly tweaked from the default shader. @Maru ty for posting this its nice to see these kind of images to quickly show what each setting does. What about H&F shading? How can be possible to add material to 3ds max H&F? not at all a technical test...but had fun doing it..
works well with a couples of lights..
Hi, all those images look interesting, but I don´t realy understand (in case of fur not hair) the advantage over a selfmade shader. For rendering a pleasant fur plaid, it was more the absence of 100% utilizing AD Hair&Fur and having massive RAM flooding. The optic for itself was good enough, it was more the rude hair/fur structure, not the shader which bothered me and spit out low memory warnings like hell. The only alternative seem to be Ornatrix or HairFarm, but I always had the wish corona would offer an inhouse solution like corona scatter instead of Forestpack. What is the real benefit of the shader? Is it just for Hair in combination with e.g. DAZ 3D ?! If there would be an implementation of H&F like Vray etc. use, would H&F still remain as a RAM eater? Does Ornatrix handle this problem better? Lots of questions sorry. Apart from the hair shader, which is physically plausible (it actually simulates how light reacts with real hair), Corona can now take advantage of instancing when rendering hair. So you can expect huge RAM saving when rendering hair now*. Keep in mind that all this hair related stuff is still WIP. As someone who does not know any of the details of the calculations involved (not being a coder! ), there are two differences that are still visible to me about the hair material just from rendering it. The first is that it has transmission through the volume, somewhat like SSS, as can be seen in the image below with an array of regular cylinders lit by a sun. The second is that the shape of the highlight is different, somewhat like anisotropy, as seen in the other image where the hair material is applied to a regular sphere. And I am sure there is much more to it than that! But those are two visible differences that I hope show some ways that the hair material is different from any other sort of regular material (plus it has controls for melanin and pheomelanin to control color, has colorless and colored speculars, etc. - all of which makes it more suited to the task of rendering realistic hair and fur than regular materials). Nothing dramatic here, just wanted to have a scene with dynamics, so used the free sample scene from Ornatrix (https://ephere.com/plugins/autodesk/max/ornatrix/docs/5/Simple_Bird_With_Dynamic_Feathers.html) and went for a shiny metallic look for the bird using CoronaHair. You definitely can't make certain materials using generic shader look convincing. 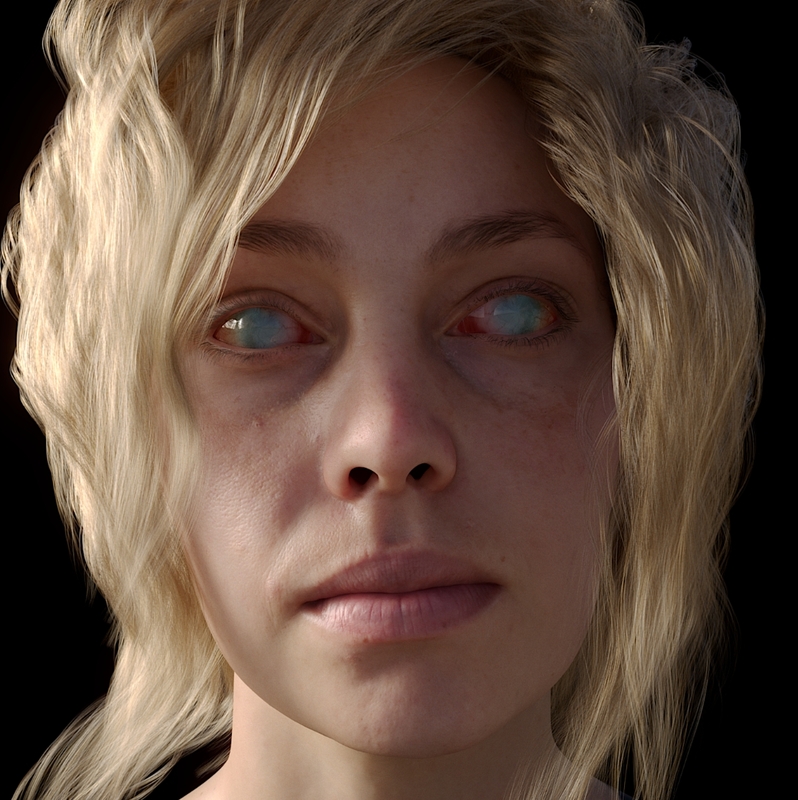 Hair, Skin, Wood and certain rough materials have such different surface characteristic (multi-lobe specular response, special subsurface behavior, multi-directional anisotropy,etc..) that making them from generic shader will look wrong no matter how much effort is given to it. That, and very nice default presets optimized for characteristic look. All these weird, low-poly hair models make the shader look like from 1995 though :- ). Games running on PS4 (Rise of tomb raider, Uncharted 4, Horizon Zero Dawn) have higher fidelity in hair than this. Thanks for all these demonstrative explenations. I really have to play around with it to test the RAM saving aspect. But Juraj`s rude 90s comparison was my first impression as well, a little bit if Malibu Stacy refuses washing her hair. But this shows clearly the need of addons like Ornatrix or a proper use of H&F ... or somewhere in the future "Corona Hairbrush 3000 "
Checking the "render as planes" option, which is hidden in devel/debug rollout. When enabled, rendering is much faster and with less noise, but the hair appear less realistic. Currently there also is an issue with Embree which may introduce some artifacts when this option is enabled. I would say that's super trade-off. I would rather render billion planes, I cannot tell the difference :- ). The AA is superior too. I second that Rawalanche ^^ ** same thing for the tesselation, like facial hairs they are super short, I don't need them to be as tesselated as the long hairs etc. I guess it can optimise RAM that way and render time as well . Ok, CoronaHairMtl now works with H&F. But, is it normal, when I change some CoronaHairMtl (Diffuse Color, for example) I need to wait 10 second for the IR update? It looks like Corona needs to rebuilt the hairs geometry structure, every time. It's very difficult to "play" with CoronaHairMtl in IR, because every shading change is so slow. In order to render Hair&Fur, all the hairs are first dump from 3ds max to a file and then loaded by Corona, that can take a pretty long time. Yes, we are aware of this issue and will work on it. For now I recommend using opacity equal to 1 (it is also more physically correct). Maybe will we have some improvement about IR and H&F speed in the next release? Or is it impossible, because 3ds max? I'm starting some tests with the new hair shader. It seems to be quite slow. I've plugged the same map in both hair and diffuse color, everything else is set to defaults. Yes I know that. But 490 000 rays/s on a dual xeon 2683 v3 (so 28 cores / 56 threads), on approx. 1200x900px is really really slow. Make sure you are rendering hair as planes, not cylinders, and definitely make sure you are not using any opacity mapping. These two things can slow rendering down extremely. Like he said, don't use Opacity ! and you don't need opacity, this shader has super nice SSS build in to simulate real hair scattering. and as a comparaison , in just a few minute I get this result , I don't know what you did wrong with you'r scene.. and I have only 4 cores 8 threads.. I7 2600k ..
Why do I have this strange white dots? They are positioned on the hairs segments vertexes. Also, I don't see any differences when I change the Curve Subdivs parameter. In mantis a bug report with video: during the animations, I have some frames competently black. cecofuli, I just did test and it's the glint that does that ... definately something to check in there I guess.. if you put it to zero it's ok. And BTW, the subdivs are there for hairfarm, if you use ahir and fur or ornatrix you don't need to touch it there. Can this be used for grass or carpeting? hmm does grass or carpet are made of hairs ? lol it's not a tool for making actual hair, it's a shader to put on hairs or fur , it's different. If you'r capet is made of fur, like a bear carpet, then yes, if it's a fabric carpet, then you'r better with the coronaMtl . That's way better now ! BTW, There is some uncleanable high noise on the ground. I guess it is introduced by hairMaterial as i never seen that kind of noise before. What hair solution do you use? In native H&F hair passes acts as simple multiplier for hair count. It shouldn't affect rendering speed much. Could you tell how did you achieve mapping to work then? For me H&F mapping doesn't work with Corona. It's a downloaded assset but from what i see, it is mapped on the base geometry then in H&F material parameters, diffuse is plugged in tip color and root color. Right, but hair is still H&F or is it converted to mesh/splines? i can plug maps in whatever hair material's slots and it doesn't work except for 3d procedural ones which doesn't need UV coordinates. Can anyone else confirm if H&F mapping is picked up by Corona or not? It' still H&F, rendering set to geometry in Env effects. Hmm, i think i found what it is. You're not using CoronaHair material in H&F mr parameters, right? I think it's wrong approach, although it seems to respect mapping and gives some remote possibility to colorize hair, but you loose all hair material controls and overal result looks much worse. I guess we need to wait for full and proper H&F support to be implemented. No, Hair material is applied on the base mesh, not in the MR shader, simply because it's not a MR shader. So this is why i'm not able to get those nice specular effects ! So i have to set the H&F env. effect to buffer instead of geometry ? Well i left H&F env. effect as geometry but I've plugged coronaHairMtl into the MR shader, it seems to be set up correctly now and i confirm that mapping does not work that way. Hair passes have now way less influence over render time, i've set it to 3 and still have good performances. I have to say i'm pretty impressed by this shader right now, here is what i got. Bigguns, we cannot insert 0 as Curve subdivs. with 1, I have this strange white dots on every vertex. I think it's a bug. also, you wrote to put "zero" to avoid the white dots. But.. in which option =) ? As far as i can tell, settings in env. effects tab has no influence on Corona hair implementation, so you can leave it as it is. Low Rays/s can be caused by HairFarm atmospherics effect - disable hairfarm renderer and/or disable atmospherics in common renderer settings to get 10x speed boost. Some minor adjustment on the dead cat, the shader is promising. looks like some hair is missing along the grey fur gaps. Furthermore the fur looks quite scruffy "unstroked" and those extincted eyes look like the cat is more than sleeping. But anyway, leaving the "dead cat" on cobblestones is way to cruel, it looks like passed over by a car... not funny. Well if you look at a carpet close enough, you will most probably see that it's made of fibers which are pretty much hair-like (they scatter light, are reflective, etc), so if you need super high quality carpet for close ups, I think there is nothing wrong with using hair plugins with hair shader for that. But generally you can usually get away with scattering some strands and standard Corona material. I wonder if there is any way to make a grass field with some hair plugin + hair shader. I can't really think of any benefits from doing that, but who knows... As far as I know Ornatrix can be used to scatter trees, grass, or other plants. Just a note on using 3ds H&F modifier: just forget about the effects dialog. Leave those settings at defaults. Then plug Corona's hair mtl into the mr shader slot. That's the only workflow for now. Ok about the white dots: if, in the H&F I use a standard CoronaMtl with glossy, no problem at all. The problem appear when I use CoronaHairMtl. Try to play with Glints Strenght value, with your hairs are big like a small tubes. We have to wait for martinsik to take a look at this and tell us what it is. It could be a bug. It could be an intended feature. The dots are inteded irregularities introduced by the glint parameter. If you want to remove these irregularities set glint strength to 0. I meant, put zero in the glint, in the shader , by default the glint value is 0,2 , put 0 and it will be ok . Both Corona normal, Corona DR and backburner never unlock the Ram used by Corona. It keeps growing and growing with each Frame until it runs out of RAM, then it pages. Paging is handled fine with no performance loss, until it is maxed out. Then corona crashes and backburner saves a black frame, then the whole process is restarted. normally my 8350@4,7ghy does ~2.2mio rays/s in normal scenes. With CoronaHairMTL in mrShader slot it crashes to 600k rays/s. The interesting thing though: if you convert to mesh, it does 900k rays/s. No opacity used. Should there be really such a performance hit for not converting to geo in 3dsMax before sending it of to Corona? Edit: screenshot in Attatchments of Corona massing Ram and never unlocking until crash. Both DrSlave and Workstation produced a black frame once they ran out of all virtual memory. Screenshot is after crash an hour before. Where it was 45 /45 GB virtual ram. personnaly I did not tried it with hair and fur since I don't use it anymore.. it's so so bad.. but , you should not apply the material to the material slot in the hair and fur, it's for MR material. Just appy it to the emitter mesh , that's it. Also, in the environment ( never render the hairs as geo ! that shader is not made to work well on geo hairs! you'r loosing most of the quality of it by oding that and it takes more RAM ) I guess you should use buffer mode , but I'm not sure since I did not test it with hair and fur. Yeah, I was about to say after I double checked with the Changelog. I indeed had it set to geometry and that caused all the incorrect Ramlocking. With buffer mode it seems to.be all fine. Also will parse times always be this aweful with H&F? For 2.5mio strands its almost a minute. do you use "render as planes" option? Yeah, it is on by default. Was just suprised to find mesh faster than Hair & Fur Buffer. I just want to react about the poll of this topic. No matter the outcome of the poll, I think that what matter the most is that all the shaders follows the same rules. Thus, if the coronamtl stick with glossiness input, then the Hair shader should behave the same way. Btw, from these two workflows, one of them seems to stand out as the standard today and it's the roughness one. I think YOU (devs) have to make that choice, not us (users), because i think (in most cases) you are responsible for making adopt these new workflows by imposing them. I think that's how a standard become a standard. I think it's really great to ask user feedback and this is one of the thing i love with corona development but on certain subjects like this one, I think we should not intervene. Of course, this my point of view and i will understand some people will disagree with me. I just want to introduce some constructive discussion about that because it seems important to my eyes. Converted my hairfarm daniel craig haircut to Ornatrix yesterday while learning ornatrix and rendered it with my latest set up of my corona hair shader . Nice ! Still with custom glints ? yes and I have a new idea wich I think will improve it even more.. just need to test it ..
Hi there, some more test . The haircut is from Tarkan Sarim , he sent me the splines and I transferred to ornatrix it was originally done in Xgen. Is that He-Man or some lady from German olympics representation? Great looking results! Many thanks for posting these and testing it extensively! Now when Corona Team has access to Chaos Group knoledge base, is there a chance that CoronaHair can be made fully functional with 3ds max H&F in the future? which aspect of the 3dsmax h&f is not working? It now works in interactive, and we already consulted about the memory leak problem - we made it smaller, but there is a bug in 3dsmax implementation that makes it impossible for us not to leak at least some memory every time we render it. CoronaHair is not mappable in combination with H&F. Or should i say UV coordinates are not transfering from H&F to CoronaHair. No, it's not on mantis yet. I'll create report later. BTW, if it's autodesk bug, does that mean that it will work in later max versions? Maybe it's already working in max2017-18? Anyone can check that? I haven't found it to be working in 2017 with Corona hair mtl, though I am not that familiar with Max hair and fur yet so maybe I missed a setting someplace, will try to do some more testing and see! One issue with Max H&F I am aware of is that the base object is not rendered. It's already logged in our internal task tracker. (*) The spline (hair guides) are linked to the head and the head is linked to a dummy. (*) The dummy has a simple 360° rotation. Maybe if you detach the splines from the head. Use them just to recomb the guides and deform, after that detach from Spline Deform. 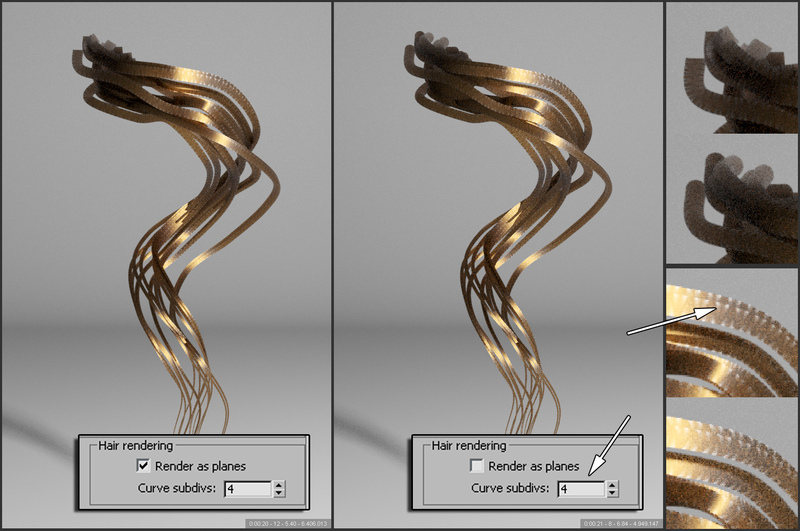 So, if someone here is using 3ds Max native hair and fur, would you rather have the base object visible or not? The default behavior in Max is to have the base object visible, but there are also some arguments to have it hidden (e.g. you usually put hair on a lowpoly "cap" object). Does Corona support hair object mapping along the strands? Not only roots and tips like in max's H&F, but proper mapping vith maps? Maybe with Ornatrix or Hairfarm it's possible? Looks like it's working with Ornatrix and native hair and fur, at least with the gradient ramp. Let me know if that's not what you meant. Yes, that's exactly what i wanted. Great that it works with H&F too! Thanks maru!